It's not just about the classes here at FSHA. In addition to a full slate of class offerings, including 24 Advanced Placement classes and electives that cover all disciplines, learning extends throughout and beyond the classroom. The mathematics department prepares each student for further study by providing a solid foundation in mathematical skills while encouraging organized critical thinking. By providing a caring learning environment, the department helps students become independent problem solvers. The department integrates technology in all of its courses helping students to focus on reasoning skills and visualize mathematical concepts. The department uses many different teaching strategies in its pursuit of providing students with the best possible mathematics education. The curriculum is designed to meet the needs of a very diverse student body. Every member of the department is sensitive to the varying levels of skills and enthusiasm. We offer daily tutoring, summer math review courses, as well as an advanced math curriculum that provides both rigorous instruction and builds personal confidence. Advanced Algebra, a full-year course, is a more rigorous approach to the study of algebra. Students will be involved in: exploring and discovering math concepts, connecting algebra to the real world and to other subjects and math topics, building understanding of the concepts that provide a strong foundation for future courses and careers. Prerequisite: B for two semesters in Honors Geometry and department approval. Honors Algebra II with Trigonometry is a preparatory course for work in higher mathematics. Those who expect to go into Calculus are expected to take this course together with Honors Precalculus. Emphasis is placed on a functional, graphic approach, problem-solving, development of abstract thinking skills and student interaction. The course includes quadratic, logarithmic, exponential, and trigonometric function, the binomial theorem, and the complex number system. TI-84 graphing calculator required. Algebra I is a full-year course that focuses on the basic language of mathematics. An understanding of algebra is required for further work in mathematics and many other disciplines. The student will learn to deal with abstract concepts and apply them in a logical way, as well as to manipulate algebraic symbols in order to represent situations when solving problems. Prerequisite: C- for two semesters in Geometry or Honors Geometry; if below C-, then successful completion of summer Geometry course; and/or placement test and/or department approval. Algebra II is a full-year course that integrates the previous courses of Algebra I and Geometry. Emphasis will be placed on graphing, and understanding the relationship between graphs and equations. Functions will be used as a unifying theme in the course, and connections from algebra to geometry, data analysis, probability, and discrete mathematics will be made. Technology will be used as a problem-solving tool. TI-84 graphing calculator required. Algebra Review is a one-semester summer course that is designed for students who need to review the concepts learned in Algebra I in preparation for their Algebra II or Honors Algebra II class. This course will review the basics of Algebra I and introduce students to the difficult algebraic concepts used in Algebra II. It is strongly recommended for students going into Algebra II or Honors Algebra II that need reinforcement of their algebra skills. This course does not receive credit toward graduation. Online Course Offered Only in the Summer. This one-semester online course covers these topics: Coordinates and graphs in the plane, relations, functions and their graphs and inverses, geometric transformations, review of transcendental functions and their graphs, continuity and discontinuity of graphs, finite and infinite limits of functions and their graphs, three dimensional graphing, areas and volumes of three dimensional solids, and conic sections. The TI-84 graphing calculator required. This is a mandatory prep course for AP Calculus. Prerequisite: Afor two semester in Honors Precalculus, department approval and successful completion of the online summer course, Analytic Geometry. Students taking this course will take the Advanced Placement examination in Calculus-AB. A passing score on that test can result in college credit. Topics covered include: limits, differential calculus, application of the derivative, integral calculus, applications of integration, and the calculus of transcendental functions. This course is an excellent preparation for those students intending to focus on the sciences, pre-medicine, or any college degree which requires Calculus. TI-84 graphing calculator required. Prerequisite: A- or higher in AP Calculus AB and Analytic Geometry II (summer) and department approval. Students taking the course will take the Advanced Placement Examination in Calculus BC. A passing score on that test may result in college credit. This course is not a continuation of Calculus AB, but rather a separate course which covers more of the college curriculum than is covered in Calculus AB. Calculus AB covers one semester of the college Calculus curriculum, while Calculus BC covers the first two semesters. Topics covered include all of those covered in Calculus AB as well as the following: L'Hospital's rule, improper integrals, partial fractions, infinite series, and parametric, vector, and polar functions. This course is an excellent preparation for those students intending to focus on the sciences, pre-medicine, or any college degree which requires Calculus. TI-84 graphing calculator required. Prerequisite: A- for two semesters in Precalculus or B for two semesters in Honors Precalculus and department approval. Students taking this course will take the Advanced Placement examination in AP Statistics. A passing score on that test can result in college credit. Topics covered include: experimental design, exploring and analyzing data, producing models using probability and simulation, and statistical inference . This course is an excellent preparation for those students intending to focus on the social sciences, business, or any college degree which requires Statistics. TI-84 graphing calculator required. Prerequisite: B- or better for two semesters in Precalculus or C or better in Honors Precalculus; and/or placement exam; and/or department approval. This one year-course will cover these topics: functions and their graphs, differentiation using limits and continuity, average rates of change, instantaneous rates of change, high order derivatives, applications of differentiation to find relative maximum and minimum and their graphs, absolute maximum and minimum problems, exponential and logarithmic functions and their graphs as well as their derivatives, integration, integration over an interval, finding the area using integration as well as the area between curves and the various integration techniques, applications of integral using economic applications, application of models, improper integrals, probability and volume. TI-84 graphing calculator is required. Prerequisite: B for two semesters in Honors Precalculus and department approval. The one-year course will cover differential and integral calculus including: limits, slopes, tangent lines, velocity, rates of change, transcendental functions, and the chain rule. These topics will be used to solve real world problems involving related rates, maxima, minima, area and volume. TI-82 or 83 graphing calculator is required. Prerequisite: C- for the two semesters in Algebra I or Advanced Algebra I; if below C-, then successful completion of summer Algebra I course and/or placement test; and department approval. Geometry supports the development of patterns of logical thought utilizing the principles of inductive and deductive reasoning. This one-year course is normally taught between Algebra I and II, since its concepts comprise one-third of the PSAT and SAT exam. Topics include: geometric figures, proofs, parallelism, congruence, constructions, polygons, similarity, and right triangles. Algebra skills are reviewed on a regular basis. TI-83 graphing calculator required. Prerequisite: B for two semesters in Advanced Algebra I or A for two semesters in Algebra I or placement exam (incoming 9th graders) and department approval. Honors Geometry is a rigorous approach to plane and solid geometry for students who are accelerated in math. It is a preparatory course for work in higher mathematics. Deductive and inductive reasoning are stressed with challenging proof writing. Topics include: geometric plane and solid figures, SAT formulas, parallelism, congruence, similarity, polygons, circles, right triangles, and an integration of algebra through coordinate and analytical geometry. Linear algebra is the study of vectors, the spaces in which they live, and linear mappings between those spaces. It gives us a powerful new way to think mathematically, and it has many applications in science, engineering, economics, and any field in which multiple variables interact in ways that can be modeled by systems of linear equations. It’s therefore a required and very useful subject in college for many science and engineering majors. This yearlong course will cover a typical one-semester college linear algebra curriculum, with topics including matrix algebra, vector spaces, eigenvalues and eigenvectors, and applications to differential equations. In the sequence of standard math courses, linear algebra can be studied either before or after multivariable calculus. It’s a great fit for the student who has completed AP Calculus AB or BC, who is passionate about challenging herself to think in new ways, and who wants to increase her ability to tackle problems in the real world. Prerequisite: Successful completion of AP Calculus BC. This course is offered through the Online School for Girls (OSG). Advanced Mathematics: Multivariable Calculus and Differential Equations will cover a number of other topics beyond the AP Calculus BC curriculum, including: calculating volumes by using shells, surfaces of revolution, and centers of mass and centroids. The course also explores topics that are studied in a typical college level third semester calculus course, including vectors and vector valued functions, differentiation in several variables, optimization in several variables, multiple integration, and line and surface integrals. Advanced Mathematics concludes with an introduction to Differential Equations. Topics include solving exact first-order equations, solving second order homogeneous and nonhomogeneous linear equation, and exploring applications to various scientific fields. This course will feature discussions, projects, and other activities that will help students to develop their advanced math skills in a collaborative and creative way. Prerequisite: C in Algebra II or C- in Honors Algebra II/Trig and department approval. Precalculus is a one-year course that blends together the concepts and skills that must be mastered prior to enrollment in a college-level calculus course. This course includes college algebra, trigonometry, logs, analytic geometry and exponential functions. The foundation of calculus will be stressed throughout the materials. TI-84 graphing calculator required. Prerequisite: B in Honors Algebra II/Trig and department approval. Honors Precalculus is a one-year course that blends together all of the concepts and skills that must be mastered prior to enrollment in a college-level calculus course. This course includes college algebra, trigonometry, logs, analytic geometry and mathematical analysis. The foundation of calculus will be stressed throughout the materials. TI-84 graphing calculator required. Walking into John Robb’s mathematics classroom, you might be surprised by a few things. There’s not a piece of paper or pencil in sight, and instead of standing in front of the students lecturing, Robb is in the back – the students do most of the talking. This classroom setup may seem backward, but it’s actually very forward—utilizing new technology and teaching methods. 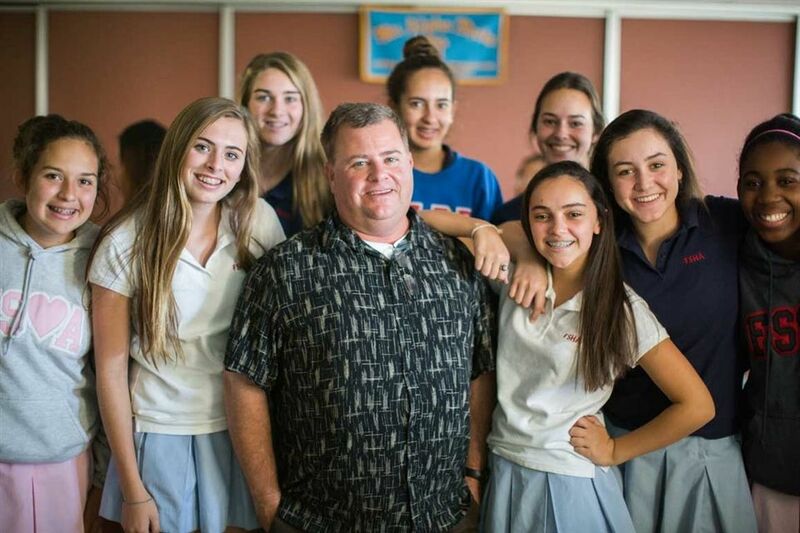 Robb, now in his 12th year of teaching at FSHA, spoke with us about his unique classroom, “flipped” teaching and getting girls to love math. Q: Why did you decide to become a teacher—and specifically a math teacher? A: While in college, I worked as a math teacher assistant at a juvenile detention center called Pride House. I was then hired to take over the math department. I enjoyed teaching, and so I decided to switch from a physics major to a math major and pursue a teaching credential. Q: Your classroom is set up a bit differently – for example, the students don’t take traditional notes in a notebook. How do you use technology in the classroom? And how has it improved the teaching experience? A: I use the laptops with software such as Remote Desktop and SMART Notebook along with “graphic tablets” so the class can work on problem sets I send to their laptops. I stand behind the students with my wireless tablet so I can observe their computer screens while we use the tablets to solve the problems. I am able to catch student errors (and correct them) as they occur, and I am able to keep all students on task. We are able to do the more difficult problems together that often get left out in a traditional class environment. Q: You also don’t do a whole lot of lecturing. Can you explain what a “flipped” classroom is? A: Basically, home and class time are switched. My students take notes for the class at home from videos I make and upload to YouTube. During class, we spend our time solving as many problems as we can fit in. Students are able to take notes at their own pace at home, then work the tough problems in class with help available from fellow students and – of course – me, the teacher. It is a very efficient use of class time. Q: Have you seen a large improvement in your students’ work since doing the “flipped” classroom? Q: How is teaching math in an all-girls setting different than a co-ed setting? A: In an all-girls setting, the girls are much more supportive of each other. There may be drama here, but nothing like in a public co-ed school. They don’t have to worry about impressing the boys. I know these girls still want to impress boys— high-school boys are absolutely on their brains all the time—but I think during class, that is pushed aside. There are a lot of girls answering questions in my class who I know wouldn’t have participated in a mixed environment. They would’ve never raised their hands. I think they just feel a lot more comfortable in this environment. Q: What does the all-girls aspect bring to the teaching experience, especially in a male-dominated field like math? A: The challenge isn’t in getting the girls to do the work; it is to get them to like math and ultimately consider a career in a STEM (Science, Technology, Engineering, Math) field. A: The way I’m teaching helps a lot. They really enjoy using the tablets and all of the technology, but it’s more than just that. It’s more of a confidence issue than anything. It’s a matter of convincing girls that they can be good at math and they are good at math. That’s a big part of it. There are a lot of people out there who influence girls’ decisions. They’ll say, “Oh, I loved school. I did this and this, but I was never good at math.” They almost say it with pride. You would never say, “I was never good at English,” or “I was never good at writing.” No one’s going to proclaim that, but it’s acceptable to proclaim not being good at math. That’s somehow OK. So I try to get them past that. It is OK to be good at math. Q: How important is it for females to go into math-driven careers? What do they bring to the table? A: They often bring a different way of thinking about problems then their male counterparts. As our world grows more and more complicated, using different ways of approaching problems is going to be critical. University of Turin - M.S. California State University, Northridge - B.S.